Warrell has been providing innovative, high quality confectionery products since 1965: we’ve been celebrating over 50 years of Sweet Success! From our humble beginnings as Pennsylvania Dutch Candies in Mount Holly Springs, PA a half century ago until the present day, we have strived to develop mutually beneficial partnerships with our customers. We believe this is a primary reason why we are able to serve the contract candy, snack, ingredient, bulk and private label manufacturing needs of some of the top food companies and retailers in North America and around the world. 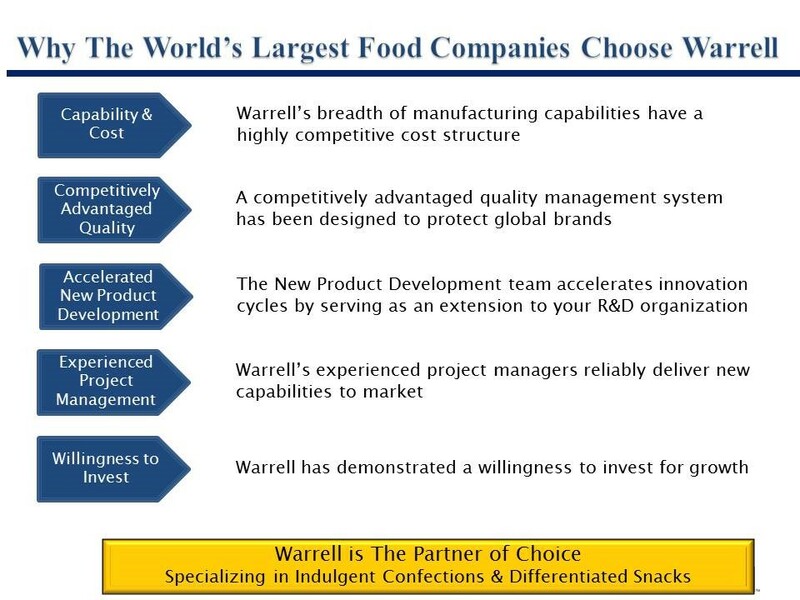 Our unrivaled candy manufacturing expertise developed over half a century enables the Warrell Corporation to meet your unique requirements. We’ve mastered eight core processes — chocolate enrobing, chocolate panning, fire roasting, brittles, nut cluster squares, caramel, taffy and protein-rich, round snack bites — that are executed to perfection in our modern facilities in Camp Hill and York, PA.
Our latest addition is the commercialization of our eighth manufacturing process that produces nutrient-rich, round snack bites. An enrobed protein center is covered with steel-cut oats and an array of dry ingredients that delivers on the round snack bite form made popular on Pinterest. We’ve used multiple centers, coatings, and topical products as part of this innovation series. One example is a crunchy protein center covered with chocolate, then tumbled with oats, and chocolate chips. We’ve also innovated with nutrient rich coconut, baobab, seeds, ancient grains and superfruits. We also offer a full range of support services such as packaging, research and development, dry roasting and more. We implement the most stringent quality assurance procedures to ensure you receive consistent, high quality products. We continue to be a Central PA-based company with strong ties to the surrounding local communities. We believe that by giving back to the communities in which we serve, we can make a positive contribution to the betterment of everyone. As a family-owned and managed company, we also understand the importance of the role our employees have in our ongoing success. We take the same partnership approach with our customers as with our employees to ensure they reach their full potential. Our plans are to continue building upon our success in candy and snack manufacturing. With our unique insights we have gained over 50 years of contract manufacturing experience and constant pursuit of knowing what your consumers want today, we continue to introduce exciting new products to the marketplace all the time. Our marketing and R&D team work together to keep up with the latest trends, newly discovered ingredients, and desires of tomorrows customers. We also continue to focus on developing successful partnerships with our customers and the communities we’re privileged to serve. Since moving our plant to Camp Hill, we have invested millions of dollars to improve efficiencies in processing, packaging, and sourcing ingredients. Contact us for your next candy or snack project! We will become your Partner of Choice for contract manufacturing and private label products.